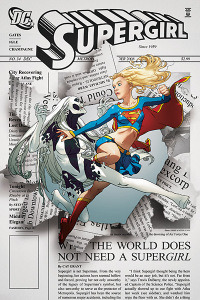 One of the things I liked at the Superman panel in Baltimore was the focus placed on Supergirl’s new creative team of Sterling Gates and Jamal Igle. They seem to really want to work to make Supergirl a good title in DC’s stable, and to make Kara Zor-El a cool character. Their debut issue, number 34, succeeds at this. Cat Grant’s attacks on Supergirl are mean but seem true. Kara has powers but doesn’t know how to use them well, so she breaks a man’s arm accidentally when she saves his life. Clark advises her that she’ll figure that stuff out over time, but that she needs to have a life outside of being Supergirl. Her reactions seem honest, and Gates does a nice job with the stock “hero goes to talk to other heroes” scenes. Igle’s art is nice here. Here’s a preview of the first few pages. Kara feels strong but believable as a 16-year-old girl, with a figure that’s not outrageously curvy. A touch I particularly liked is that he illustrates the shorts Kara wears under her skirt, rather than just having her show way too much leg or putting her in skimpy underwear. Also, for all the evil that Superman has defeated in his world, the DC Universe’s MLB still seems to have inter-league play. This issue features a game between the Metropolis Meteors, the city’s National League team, and the American League Monarchs. Just for kicks, here are the other baseball teams in the DC Universe, presumably in addition to those in our world. And here are some other things to do in Metropolis.